The Charleville-Mézières’ club for women playing basketball, also known as "Flammes Carolo Basket", have finally got themselves out of the second division of women’s basketball in France after five years of trying. Six core players from their championship season in NF1 have stayed to continue the adventure. They will be joined by Kristen Mann who played in the LFB before with Tarbes during the 2007-2008 season. Unfortunately the injury to Elin Eldebrink has ruled her out of playing for the club. But they have signed former Basket Landes player and Bulgarian international Ekaterina Dimitrova in her place. French youth international Eléonore Grossemy and 1.91m tall Serbian Bojana Vulic will complete the roster. Djéné Diawara (left) who played for Mali during the FIBA World Championship for Women will have her first experience in the top flight. 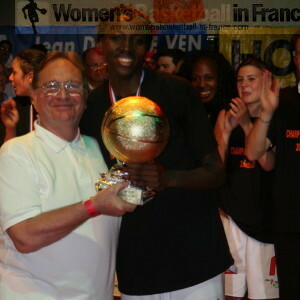 Amel Bouderra and Alexia Kusion have played in the LFB as teenagers. The LFB roster is as follows: Amel Bouderra, Carine Contessi, Bélinda M’Boma, Sarra Ouerghi, Alexia Kusion, Ekaterina Dimitrova, Kristen Mann, Djéné Diawara, Eléonore Grossemy and Bojana Vulic.